New Delhi’s plan to compel the likes of Facebook and Google to police their content threatens free speech. Coming after edicts that limit foreign e-commerce giants, there is a touch of the People’s Republic that will worry global players relying on the subcontinent for growth. 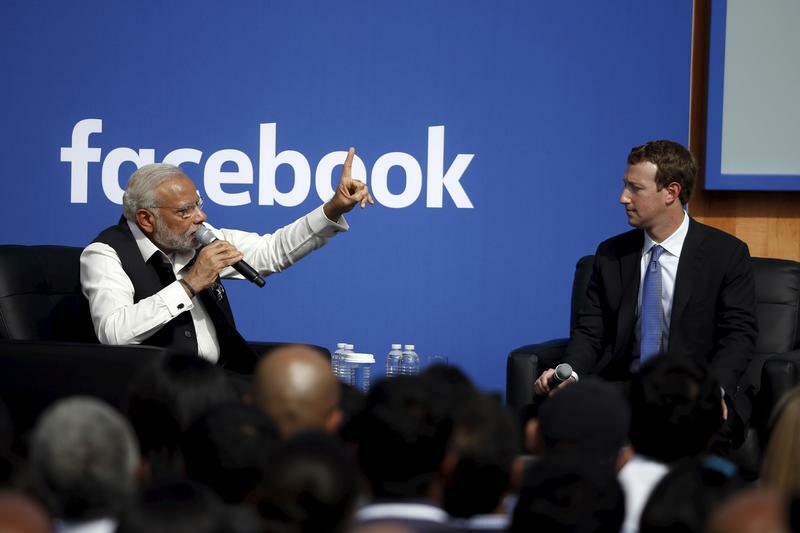 Indian Prime Minister Narendra Modi (L) and Facebook CEO Mark Zuckerberg have a conversation on stage during a town hall at Facebook's headquarters in Menlo Park, California September 27, 2015. An Asian internet lobby group, which includes Alphabet’s Google and Facebook, on Jan. 31 criticised India’s plans to regulate social media content. The proposal drafted by India’s technology ministry in December would compel companies to pro-actively prescreen user-generated content, and remove unlawful items within 24 hours and, if asked by a government agency, provide a way to trace the offending user within 72 hours. The draft has a very broad definition of “unlawful”, including anything “grossly harmful, harassing, blasphemous, defamatory” and which “threatens the unity, integrity, defence, security or sovereignty of India” among other things. “We strongly feel that blanket regulation that is overly broad and contains vague and ambiguous language will jeopardise citizens’ fundamental rights to privacy and free speech,” the Asia Internet Coalition said in a press statement. India also wants any content provider with more than 5 million local users to incorporate in the country with a physical address and contact person. The rules are open for public comments until Feb. 14.